^ Worldwide Semiconductor Foundry Market Grew 16.1 Percent in 2014, According to Final Results by Gartner. [6 August 2015]. ^ TSMC, GlobalFoundries and Samsung Lead Chip Foundry Rankings in 2012 - X-bit labs. [6 August 2015]. ^ GLOBALFOUNDRIES Fast Facts. [6 August 2015]. ^ Following Significant Technology, Capacity and Expansion Milestones, GLOBALFOUNDRIES’ Sanjay Jha to Pass Baton to Industry Veteran Tom Caulfield. 9 March 2018. ^ 9.0 9.1 9.2 9.3 Manufacturing. [6 August 2015]. ^ 半導體大廠競插旗中國 格羅方德與重慶合資12吋廠. 中時電子報. 2016-06-01. ^ 格羅方德 成都打造晶圓廠. 中時電子報. 2017-02-11. ^ 格羅方德於成都新建晶圓廠工程獲成都市政府 1 億美元投資. TechNews. 2017-06-12. ^ 〈晶圓先進製程競賽〉格羅方德退出7奈米 台積電股價大漲創近5月新高. 鉅亨網News. 2018-08-28. ^ Kampman, Jeff. GlobalFoundries adds a 12-nm node to its FD-SOI roadmap. TechReport. 8 September 2016 [16 September 2016]. ^ GlobalFoundries Saratoga County, New York, USA 互联网档案馆的存檔，存档日期10 March 2009. ^ Shilov, Anton. GlobalFoundaries Updates Roadmap. Anandtech. 3 October 2016 [3 October 2016]. ^ Kampman, Jeff. GlobalFoundries skips the 10-nm node on the way to 7-nm FinFETs. TechReport. 15 September 2016 [16 September 2016]. ^ 21.0 21.1 Jim Doyle. [6 August 2015]. 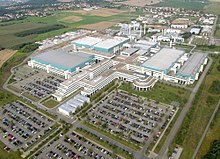 ^ globalfoundries-to-expand-capacities-build-a-fab-in-china (新闻稿). 11 February 2017.